Are you an opera lover? Then we’d love you to join our volunteer team of devoted individuals and help opera staff with projects, events, backstage tours and more! 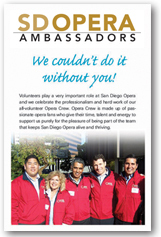 Our SDOpera Ambassadors play an essential role in supporting San Diego Opera. Take a look at the SDOpera Ambassadors Brochure for more details about each of our four opera crews, the time commitment for each assignment and what we’ll be asking you to do. 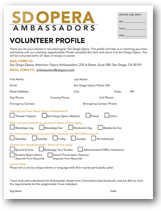 Next , download and print off the SDOpera Ambassadors Profile Form, mail or email it to the Opera and we’ll be in touch. 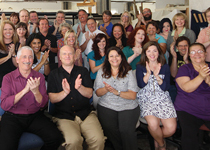 Becoming a SDOpera Ambassadors volunteer is a great way to meet like-minded new friends and, at the same time, you’ll be giving back to an important artistic San Diego institution. 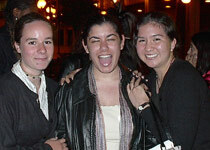 For more information about joining, email Ambassadors@sdopera.com. 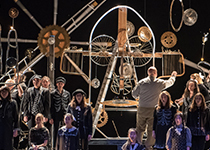 If you are interested in being onstage as a volunteer supernumerary, we would love to hear from you. To be considered and added to our active list, call the Super-hotline (619)533-7073 and leave a clear message with your name, address, email address, and phone number (and age if you are under 18) or email our Super Captain at SuperCaptain@sdopera.org. Let us know if you have any special skills. 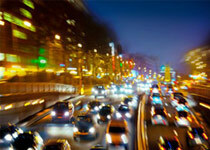 Supernumerary information packets will be mailed in the late fall.